This is Sadie Bear of Cherokee (pedigree name). We got Sadie in July of 2012 from a breeder on the Ga/ Tn Boarder. She was 7 weeks old when we got her. In the picture she is almost 6 mths old. She loves her softball My daughter plays year round softball so Sadie enjoys getting in the back yard with Savannah to chase the ball when she can. 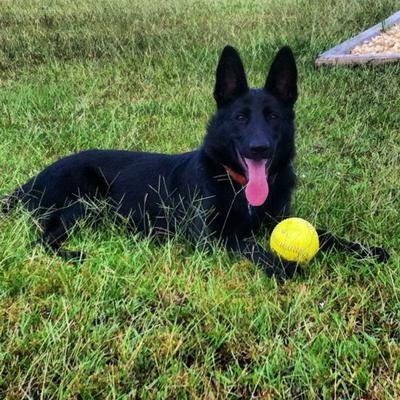 What a lovely young lady your Black German Shepherd puppy Sadie is! She is simply stunning! I love the blacks - I've owned a few of them in my lifetime and they are great looking dogs for sure. It's so great to hear that she is playful, enjoys playing with her ball and interacting with your family. I wish you nothing but the best with her. Do yourself a favor - if you get the opportunity sign all of you up for a puppy training class and go. It's a great way to socialize her at the same time you're training her and it's a great bonding experience too. Continued success with her now and in the future.